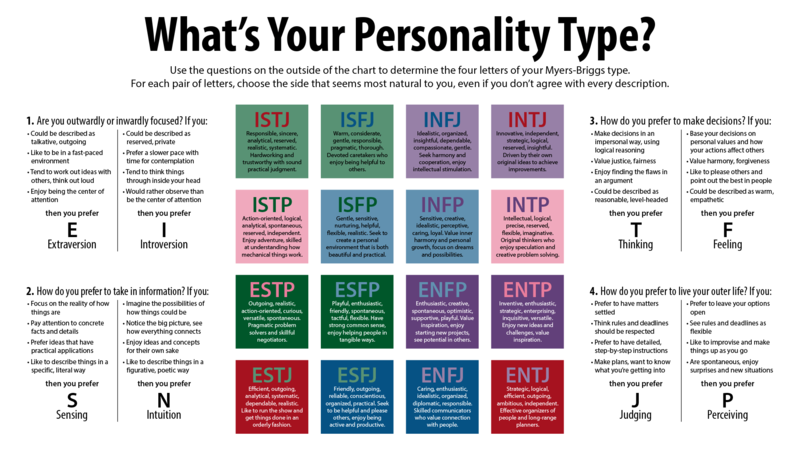 As an ENFJ, you’re primary mode of living is focused externally, where you deal with things according to how you feel about them, or how they fit into your personal value system. Your secondary mode is internal, where you take things in primarily via your intuition. ENFJs do not like dealing with impersonal reasoning. They don’t understand or appreciate its merit, and will be unhappy in situations where they’re forced to deal with logic and facts without any connection to a human element. Living in the world of people possibilities, they enjoy their plans more than their achievements. They get excited about possibilities for the future, but may become easily bored and restless with the present. With Extraverted Intuition dominating their personality, the ENTP’s primary interest in life is understanding the world that they live in. They are constantly absorbing ideas and images about the situations they are presented in their lives. Using their intuition to process this information, they are usually extremely quick and accurate in their ability to size up a situation. With the exception of their ENFP cousin, the ENTP has a deeper understanding of their environment than any of the other types. The ENTP’s auxiliary process of Introverted Thinking drives their decision making process. Although the ENTP is more interested in absorbing information than in making decisions, they are quite rational and logical in reaching conclusions. When they apply Thinking to their Intuitive perceptions, the outcome can be very powerful indeed. A well-developed ENTP is extremely visionary, inventive, and enterprising. The ENTP personality type is sometimes referred to the “Lawyer” type. The ENTP “lawyer” quickly and accurately understands a situation, and objectively and logically acts upon the situation. Their Thinking side makes their actions and decisions based on an objective list of rules or laws. If the ENTP was defending someone who had actually committed a crime, they are likely to take advantage of quirks in the law that will get their client off the hook. If they were to actually win the case, they would see their actions as completely fair and proper to the situation, because their actions were lawful. The guilt or innocence of their client would not be as relevant. If this type of reasoning goes uncompletely unchecked by the ENTP, it could result in a character that is perceived by others as unethical or even dishonest. The ENTP, who does not naturally consider the more personal or human element in decision making, should take care to notice the subjective, personal side of situations. This is a potential problem are for ENTPs. Although their logical abilities lend strength and purpose to the ENTP, they may also isolate them from their feelings and from other people. The least developed area for the ENTP is the Sensing-Feeling arena. If the Sensing areas are neglected, the ENTP may tend to not take care of details in their life. If the Feeling part of themself is neglected, the ENTP may not value other people’s input enough, or may become overly harsh and aggressive. In general, ENTPs are upbeat visionaries. They highly value knowledge, and spend much of their lives seeking a higher understanding. They live in the world of possibilities, and become excited about concepts, challenges and difficulties. When presented with a problem, they’re good at improvising and quickly come up with a creative solution. Creative, clever, curious, and theoretical, ENTPs have a broad range of possibilities in their lives.